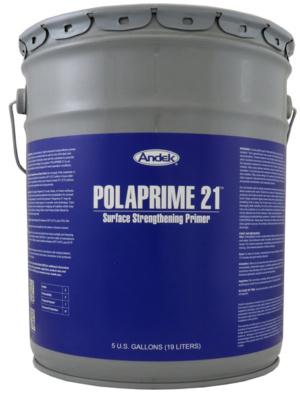 POLAPRIME 21 is a solvent-based, single component polyurethane primer that is highly effective over oxidized steel as well as new mild steel and steel reinforced concrete. Chemically reacts with the substrate to promote superior adhesion of the coatings to be applied. POLAPRIME 21 is an industrial maintenance coating designed for harsh operation conditions. Can be used over concrete, most metals, insulation, wood composite, wood, mineral composites, PUF, glass and other surfaces. Surfaces must be free of dirt, loose debris, oil, grease, or other substances that would interfere with bond. It is advisable to have the surface as dry as possible. All repairs of damage or defects must be made prior to coating. Stir thoroughly for three minutes, then keep the can covered whenever possible to prevent contaminating the primer. Apply by spray, roller, or brush. Roller and brush techniques provide best penetration and performance results. For roller application, use a medium or short nap roller. For brush application, use a natural bristle brush. Apply enough POLAPRIME 21 only to cover the surface. It is not advisable to pour Polaprime 21 straight onto the surface. Apply the appropriate surface coating as soon as possible after thorough drying to prevent contamination of the surface, ideally within 36 hours. If the POLAPRIME 21 has been left exposed for more than 48 hours, the surface must be cleaned thoroughly to remove all dirt and contaminants. Tools and equipment may be cleaned with Toluene, Xylene, or any high aromatic solvent suitable for polyurethanes. Do not apply POLAPRIME 21 if the temperature is predicted to drop below 35°F within 4 hours of completion of application. Do not apply any of the POLAPRIME 21 to saturated surfaces or substrates that have ice crystals entrapped. Do not apply if rain is forecast within 4 hours of completion of application. Use EP rated spray equipment. Read the container label warning and Safety Data Sheet (SDS) for important health and safety information prior to the use of this product.